Big Beautiful INDIAN CORN BEAD PENDANT NECKLACE - Thanksgiving Fall Autumn Harvest Native American Maize Jewelry - HUGE Cob cornucopia of colorful acrylic beads and natural Raffia Husks, each approx 2-1/2-inch Long including Husk. (Corn without husk, only 1-1/4-inch) On 24-inch Black Satin Rattail Neck Cord, with 24 autumn-color acrylic beads. 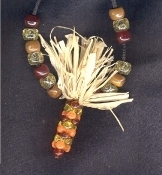 (12 on each side of corn pendant) Scarecrow Festival, Hayride, Halloween Costume wear! Choose your cord length! *Please Note: We will send neck cord length as described, if no options are chosen.